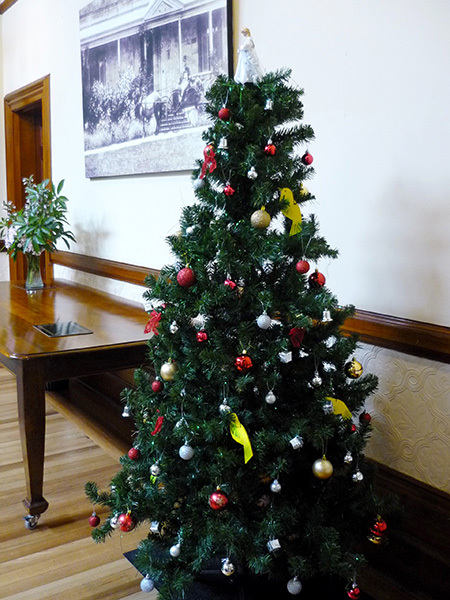 The Urrbrae House Christmas “Giving” tree in the Main Hall is once again a collection point for The Smith Family’s Christmas “Toy and Book Appeal” at the Waite Campus. Leaving a toy or book under the Urrbrae House tree is your opportunity to help bring a smile to a disadvantaged child’s face this Christmas. Sadly, thousands of Australian kids will go without receiving a gift this holiday season simply because their families can’t afford it. With your help, The Smith Family aims to deliver over 45,000 new toys and 30,000 new books to children in Australia this Christmas. The Smith Family has a long and proud association with Christmas. The organisation was founded in 1922 when five businessmen decided to deliver toys to orphans on Christmas Eve. New educational toys and books for children aged 0-12 years placed under the Urrbrae House tree will be distributed to children in need. The Smith Family has a shortage of gifts for children 9-12 years old so donations for this age group would be greatly appreciated. Gifts should not be wrapped. Toys should be no bigger than a school backpack. Please ensure batteries are included if they are required to operate a toy. The Smith Family encourages gifts of learning and educational-related items. The last day to leave your gift under our tree is: THURSDAY, 8 DECEMBER 2016. This entry was posted in Urrbrae House. Bookmark the permalink.